2019 Class Schedule - updated February 2019. Online bookings are available for classes (and very easy to do!) LIMITED SPACES - CHECK AVAILABILITY NOW!! Training with Body Logic Fitness takes place at the on-site fitness studio at 331 Devon St East, New Plymouth. If the weather is behaving, we may also arrange trainings at outside locations around New Plymouth. Training sessions will always begin with a pre-screen and functional movement screen where we have the opportunity to evaluate your health and movement patterns. This helps us to identify and cater to your individual needs by determining what areas are functioning well and those that are problematic or could become problematic without being addressed. We use this information to tailor an appropriate course of action for you and your goals. We also offer 30 minute express one-on-one training or group express sessions. Email admin@bodylogic.co.nz for more information. Our main focus is the use of the body to build strength and endurance while maintaining flexibility. There is considerable emphasis on form and technique of particular movements or exercise, to ensure safety and results. Groups will be a maximum of eight people to ensure the instructor can provide appropriate support during the session to each individual (great for those with an injury to manage). Functional Fitness classes are 50 minutes long, with the last 10 minutes focusing on stretching. These classes are for clients who have a base line fitness. Email our Practice Manager aimee@bodylogic.co.nz to discuss times and prices. A high energy and dynamic class with elements of Pilates, dance and strength training at the Ballet barre while lengthening and strengthening the whole body. 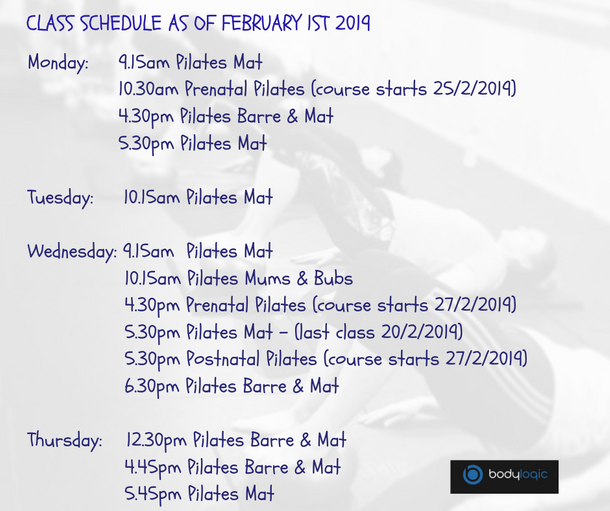 Throughout this class the STOTT Pilates method is incorporated into all movements so prepare to be challenged. This class incorporates using your own body weight as resistance on the barre, sometimes combined with toning balls, swiss balls and resistance bands to develop strength and endurance throughout your movements. Barre and Mat is a combination of Pilates Bare and Pilates Mat. This class is for people wanting that full body workout and optimal musculoskeletal performance of strength, flexibility and endurance through bare and mat exercises. Focusing on the STOTT Pilates method of exercises this class will help keep the body aligned, balanced and moving with ease. Beginner Pilates is for those who are new to the Pilates experience. You will learn the STOTT Pilates 5 Basic Principles to gain awareness and understanding of how your body moves and functions whilst being taught all the essential exercises/movements of Pilates. Pilates is a controlled approach to fitness and combines a mixture of strengthening, breathing, stretching and controlled movements. Pilates method can benefit people of all ages, gender, physical condition and fitness level. It is a useful tool for injury prevention and rehab, plus as fantastic workout in itself. Pilates is a progression based fitness and this is class to start with to ensure you are completing each movement correctly before progressing into Intermediate. It is highly recommended you complete a term of Beginner Pilates before moving into an Intermediate Pilates class. This class follows on from the beginner class where you have learnt the foundation essential movements of STOTT Pilates, you will have gained body awareness and the ability to comfortably perform the essential exercises. This class allows you to continue with your Pilates progress and incorporates intermediate level movements/exercises where you will be challenged further, lengthening those muscles more and experience building strength and endurance through your core. Small group training sessions are stimulating, motivating, performed in a fun environment and cost effective. Your program will change every session, so you’ll always feel challenged and motivated. Private group training will be the same as our functional fitness group training but you bring the group, whether is a group of friends or colleagues. All fitness classes run for approximately 50-60 minutes. We recommend you purchase a 10 pass concession, as this way you'll be making the biggest saving. If you cannot not attend a class and you give us at least 1 hours notice you will be offered a make-up class. As we can only have a maximum number of participants in each session if you book a casual spot (not paid for upfront) and cancel in less than 8 hours there may be a cancellation charge.